Flat Gold framed 30X20 bevelled mirror, a quality bevelled glass mirror with a flat gold frame with a narrow black inner edge and black coloured outer edge. Overall size.85X59cm. 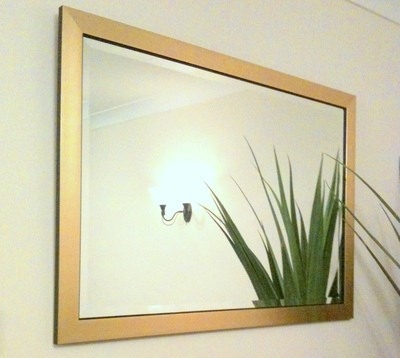 Flat gold framed 30X20 Bevelled mirror. This is a quality bevelled glass mirror framed in our own workshop. The flat profile of this frame has a brushed gold finish with a narrow black inner edge running along side the bevelled mirror and an outer black edge. Ideal for those who want to match up to gold in their decor but still wanting a plainer more modern effect.